The tainted Revolution Gaming Network is now officially on death watch. The network has seen its peak cash players decrease almost daily as players are starting to quickly abandon the once dominant network. Things went from bad to worse when one of its biggest skins Lock Poker left the network in a very public & humiliating manner. Take a look at this chart which is Peak Cash players over the last 2 weeks. These stats are directly from PokerScout.com. When you then take a look at the last 6 months its even more shocking. 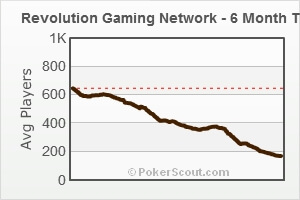 Its hard to believe that over a year ago this network had over 1,000 in peak cash players. 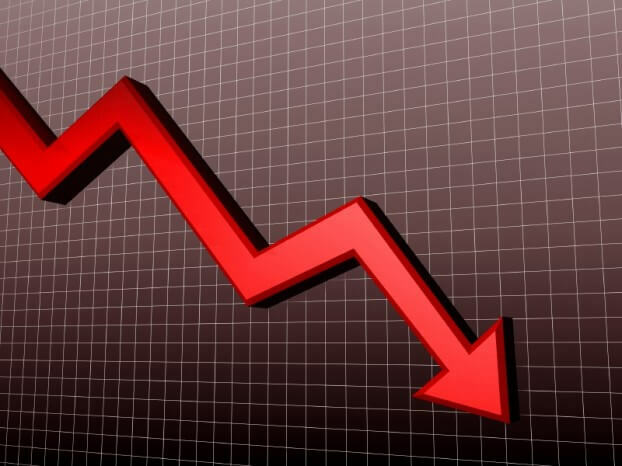 At this point it will be almost impossible for the network to turn things around as the poker industry as a whole has turned their backs on the network. The one bright spot for the network is Juicy Stakes which is the US facing brand of the network, who is finally getting through the huge backlog of withdrawal requests. The December 2013 payment report put together by John Mehaffy has raised his rating to B- from the previous months rating of a C.
So far it seems the increase in withdrawal speed for players is not slowing down the decline and its only a matter of time before the peak cash player numbers are below 100 at which point you can finally say the network is done.